Visiting the Dreamlands: Immersive Cinema and Art, 1905-2016 exhibit at the Whitney Museum functioned as a powerful reminder as to the ways in which the exhibition space fundamentally alters the cinematic experience. Traversing the Dreamlands space became an interesting form of interactivity in which the placement of particular works and the foregrounding or concealing of their apparatus dramatically refigured my own mode of engagement. From small screens unimposingly positioned along the walls (Blade Runner—Autoencoded, Broad, 2016) to large areas where the screen essentially became the entirety of the room itself, the visibility of the work, its location in relation to other works, and the foregrounding or concealment of the apparatus informed my own affective response. Two works in particular that seem to challenge notions of the screen/spectator divide as a means of affectively engaging an embodied audience are Anthony McCall’s Line Describing a Cone (1973) and Jud Yalkut’s Destruct Film (1967). Both of these pieces utilize the exhibition space in fundamentally different ways and invite viewer interaction that highlights the materiality of the medium itself. Destruct Film is an anarchic cinematic experience where film leaders and other images are projected throughout the room and are repositioned by way of mirrors. 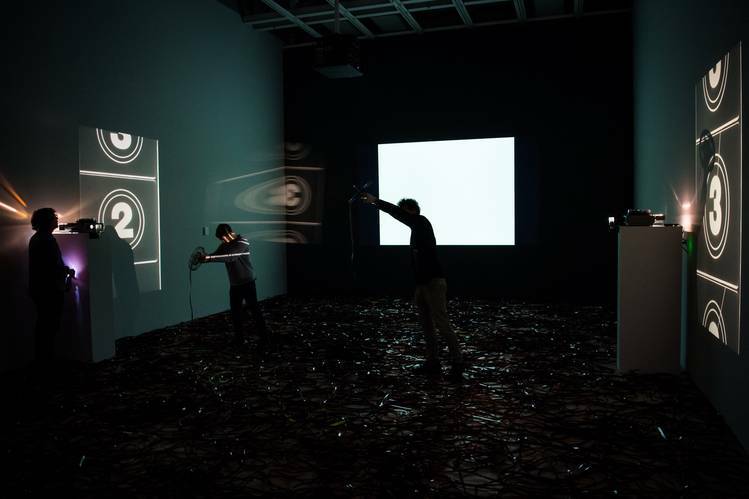 Furthermore, the room itself is strewn with unspooled filmstock that spectators are encouraged to touch, wade through, and examine. In effect, any notion of separation between screen and spectator collapses as the imagery is constantly repositioned while the audience is physically entangled in 16mm filmstock. McCall’s Line Describing a Cone similarly collapses the space between screen and spectator yet does so in a fundamentally different way. Rather than rely on the materiality of the filmstock, McCall’s work instead functions as a reminder of the very physicality of light itself. Through the incorporation of a fog machine in a pitch-black space, the projected image refracts ever so slightly as it collides with the particles of smoke hanging in the air and the effect is one of making material the otherwise imperceptible. The resulting “solid” beam of light, which slowly traces a circle on the screen, is one that seems to offer a tactile surface even in its immateriality. Both of these works invite viewers to explore the space and feel the effects (affects) of film. Of course all of these works seem to speak to the ways in which cinema’s relocation to the gallery space reinscribes film as an auratic medium. The seemingly unique physicality of the experience positioned within a “privileged” space problematizes the idea of cinematic reproducibility. Not only do these works take on the “false aura of commodity” (Balsom) by way of their positioning as single works in a private space but additionally, the way the exhibition space and the work of art become inseparable expands the work beyond the confines of film alone and thus makes the museum space itself a necessary element of the experience. Balsom, Erika. “A Cinema in the Gallery, a Cinema in Ruins.” Screen 50.4. Winter, 2009.